This article is about the minigames in Super Mario World 2: Yoshi's Island. For the bonus areas in Luigi's Mansion: Dark Moon, see Bonus Challenge (Luigi's Mansion: Dark Moon). Yellow Yoshi after flipping the Kamek card in the Bonus Challenge Flip Cards in Super Mario World 2: Yoshi's Island. 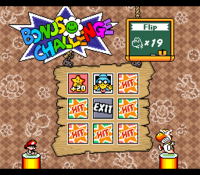 Bonus Challenges are Bonus Games in Super Mario World 2: Yoshi's Island, its remake, and Yoshi's Island DS. When a Yoshi reaches the goal roulette and the roulette lands on a flower, then a Bonus Challenge can be instantly played. In the original Yoshi's Island, a specific Bonus Challenge can also be unlocked and played anytime after getting 800 points in a world; in the later two games, they can be accessed after getting 700 points in a world. The list of Bonus Challenges are below. Drawing Lots was the only Bonus Challenge that did not appear in Yoshi's Island DS, most likely due to the fact that the game has only five worlds as opposed to six, and that the player couldn't use items in this game. In Yoshi's Island DS, the background music shares some similarities with the underwater theme from the original Super Mario Bros. This page was last edited on August 31, 2018, at 22:19.